I was excited to get in on the Lovely Package Exchange, hosted by Oh Hello Friend. It’s a gift exchange among bloggers—which as of last year, I qualify as a blogger! 🙂 Unknown if it was random or on purpose, but I got matched with a fellow Austinite, Gretchen. We met up at Quack’s last week to exchange presents instead of sending them in the mail. The emphasis is on sending a “lovely package” with a present of about $30. 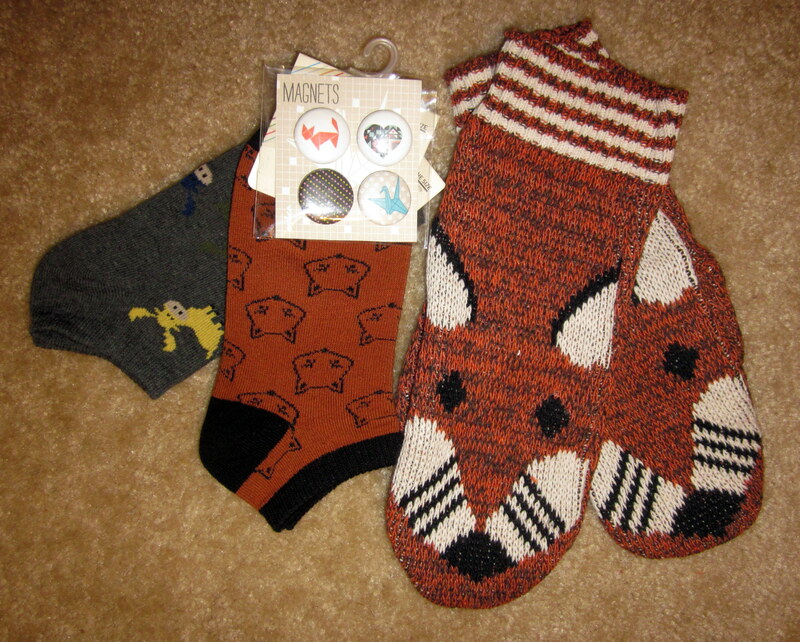 Gretchen likes foxes, so I got her some fox mittens from Uncommon Goods, fox and moose socks from Forever 21, and origami magnets (one depicts a fox) from the Blue Genie Art Bazaar. For the packaging, I made felt poms. I cut out strips of felt, made small cuts along one edge, and then rolled and glued it together (you could also sew it together after it’s been rolled up, but I hate sewing). Super easy! I wrapped the box in packing paper and then a strip of holiday wrapping paper. It was all tied together with red ribbon and had three felt poms attached. 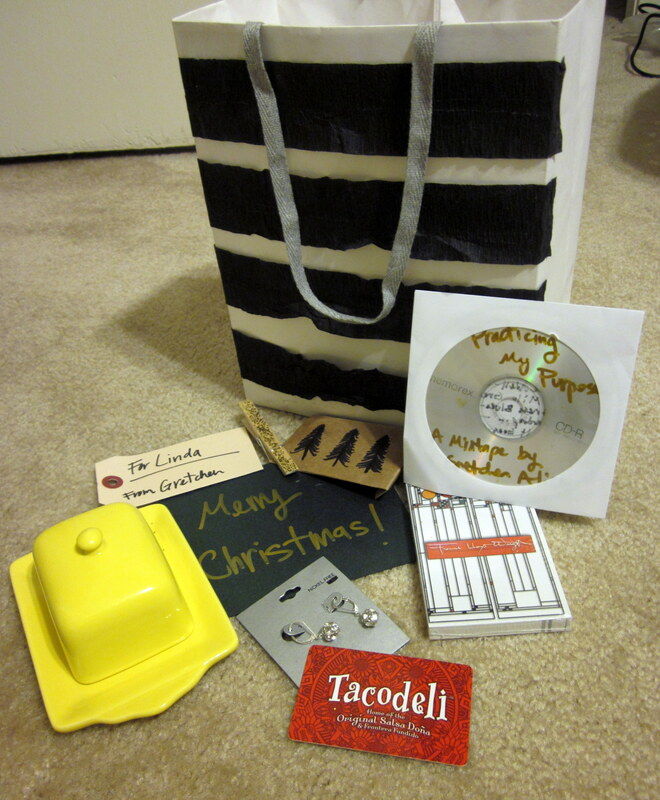 Gretchen gifted me a cute yellow butter dish, earrings, a notepad, a Tacodeli giftcard, and a CD mix she made. She used a tissue paper roll, a striped crepe paper bag, and a card clipped with a glittered clothespin for her packaging. I’m so happy that I made my first friend through the blogging world. I’m looking forward to more blogging connections! 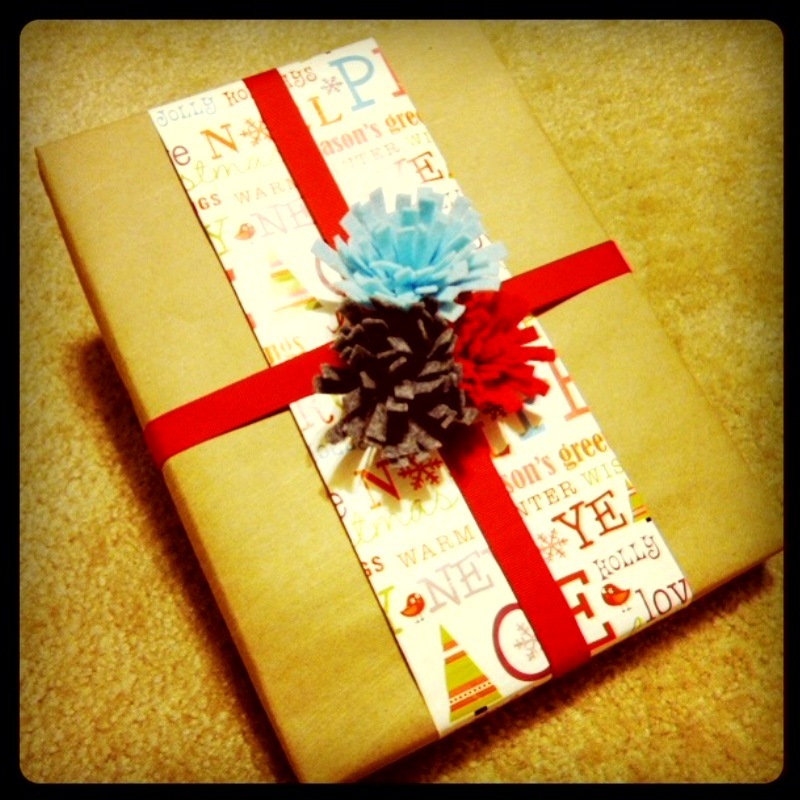 This entry was posted in Gifts and tagged Exchange, packaging. Bookmark the permalink. Those felt poms are awesome. I wish I had known about those pre-holidays!